I read it in just a few short days and I loved it. It truly amazes me when authors are so prolific w/ new ideas. I thought Suzanne Collins' series, Gregor was fascinating. This whole created world underneath our world, accessed through a vent in a laundry room was cool and now, to have created this look into the future through The Hunger Games; well, I'm just bowled over with her creativity! 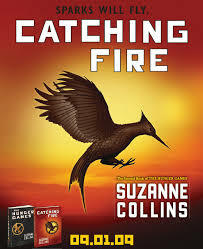 Enjoy the video and click here for Scholastic website where I found tons of cool videos featuring Suzanne Collins discussing life, books and the similarities between Gregor and Hunger Games series. What impresses me most is how real her characters become and how involved I feel. I worry when Katniss doesn't eat enough. I feel involved with Peeta, Prim, and Gale and this time getting a closer look at past games and how they affected their parents generation was interesting. A peaceful person by nature, I struggle through the actual Hunger Game event, which causes me to cheer when Katniss truly listens to Haymitch's message; who is the real enemy?? I'm excited for the next in the series but I've got a lot of other books to read in the meantime!